One of the most useful, ornamental shrubs we&apos;ve found! This native shrub grows 4 ft. tall with a similar spread. In April, white to blush flowers bloom and attract hummingbirds, bees and butterflies. New growth foliage emerges red in the springtime and turns glossy, dark green. In zones 6 and south, the foliage is evergreen. 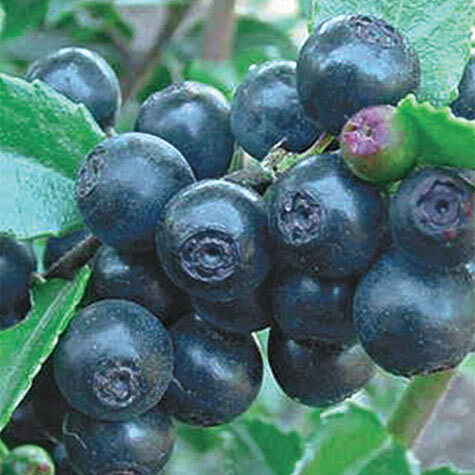 The deep purple-blue berries are good for fresh eating, sauces and preserves. If left on the plant, the birds will happily eat them. 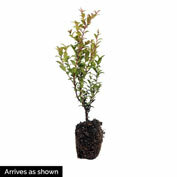 The huckleberry is ideal for a specimen planting, a hedge or grouped in the landscape. Plant in full sun to partial shade. Self-pollinating. Zones 5-8. Depth: Same as in the nursery. 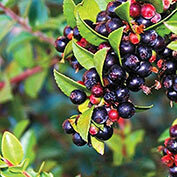 Foliage: Small ovate leaves,evergreen South of zone 6, glossy dark green, new growth is red in Spring. Fruit: 1/4 inch; deep glossy purple-blue berries. 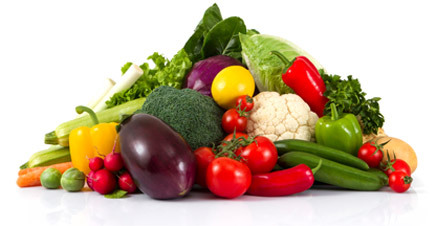 Soil Requirements: Moist, well-drained, acidic soil, (similiar to blueberries). Pruning: Huckleberries grow slowly. Other than removing dead or damaged branches, pruning is not needed nor recommended in young plantings. Size: Urn shaped white to blush blooms. Comments: Remarkable evergreen native shrub, valuable for fruit and landscape, can be used as a hedge, shrub, garden, plant or container grown. Foliage looks good year round, little blush pink to white blossoms followed by glossy deep purple-blue berries, can be grown in partial shade, but will produce more berries in the sun. Berries attract wildlife, flowers attract hummingbirds, bees, and butterflies, branches are also used in flower arrangements.